Ever-improving Wi-Fi standards make for denser, faster Wi-Fi networks. IDG Communications, Inc. Photo contributed by Matthew Mikaelian. In the world of wireless, the term Wi-Fi is synonymous with wireless access in general, despite the fact that it is a specific trademark owned by the Wi-Fi Alliance, a group dedicated to certifying that Wi-Fi products meet the IEEE’s set of 802.11 wireless standards. These standards, with names such as 802.11b (pronounced “Eight-O-Two-Eleven-Bee”, ignore the “dot”) and 802.11ac, comprise a family of specifications that started in the 1990s and continues to grow today. The 802.11 standards codify improvements that boost wireless throughput and range as well as the use of new frequencies as they become available. They also address new technologies that reduce power consumption. What is Wi-Fi 6? Wi-Fi 5? Wi-Fi 4? The IEEE naming scheme for the standard is a little tough to get used to, and in an effort to make it easier to understand, the Wi-Fi Alliance has come up with some simpler names. 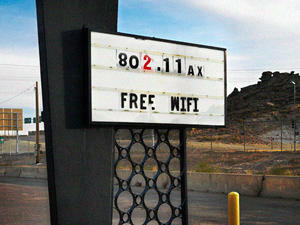 Under its naming convention, the alliance calls 802.11ax Wi-Fi 6. 802.11ac is now Wi-Fi 5, and 802.11n is Wi-Fi 4. The idea, according to the Wi-Fi Alliance, is to make matching endpoint and router capabilities a simpler matter for the rank-and-file user of Wi-Fi technology. Meanwhile it's important to know that the Wi-Fi Alliance has not made up simpler names for all the 802.11 standars, so it's important to be familiar with the traditional designations. Also, the IEEE, which continues to work on newer versions of 802.11, has not adopted these new names, so trying to track down details about them using the new names will make the task more complicated. The traditional names of these standards create quite an alphabet soup, made all-the-more confusing because they are not arranged alphabetically. To help clarify the situation, here’s an update on these physical-layer standards within 802.11, listed in reverse chronological order, with the newest standards at the top, and the oldest toward the bottom. After that is a description of standards that are still in the works. Also known as Wi-Fi HaLow, 802.11ah defines operation of license-exempt networks in frequency bands below 1GHz (typically the 900 MHz band), excluding the TV White Space bands. In the U.S., this includes 908-928MHz, with varying frequencies in other countries. The purpose of 802.11ah is to create extended-range Wi-Fi networks that go beyond typical networks in the 2.4GHz and 5GHz space (remember, lower frequency means longer range), with data speeds up to 347Mbps. In addition, the standard aims to have lower energy consumption, useful for Internet of Things devices to communicate across long ranges without using a lot of energy. But it also could compete with Bluetooth technologies in the home due to its lower energy needs. The protocol was approved in September 2016 and published in May 2017. Approved in December 2012, 802.11ad is very fast - it can provide up to 6.7Gbps of data rate across the 60 GHz frequency, but that comes at a cost of distance – you achieve this only if your client device is situated within 3.3 meters (only 11 feet) of the access point. Current home wireless routers are likely 802.1ac-compliant, and operate in the 5 GHz frequency space. With Multiple Input, Multiple Output (MIMO) – multiple antennas on sending and receiving devices to reduce error and boost speed – this standard supports data rates up to 3.46Gbps. Some router vendors include technologies that support the 2.4GHz frequency via 802.11n, providing support for older client devices that may have 802.11b/g/n radios, but also providing additional bandwidth for improved data rates. The first standard to specify MIMO, 802.11n was approved in October 2009 and allows for usage in two frequencies - 2.4GHz and 5GHz, with speeds up to 600Mbps. When you hear wireless LAN vendors use the term “dual-band”, it refers to being able to deliver data across these two frequencies. The first “letter” following the June 1997 approval of the 802.11 standard, this one provided for operation in the 5GHz frequency, with data rates up to 54Mbps. Counterintuitively, 802.11a came out later than 802.11b, causing some confusion in the marketplace because eople expected that the standard with the "b" at the end would be backward compatible with the one with the "a" at the end. Released in September 1999, it’s most likely that your first home router was 802.11b, which operates in the 2.4GHz frequency and provides a data rate up to 11 Mbps. Interestingly, 802.11a products hit the market before 802.11a, which was approved at the same time but didn’t hit the market until later. The first standard, providing a data rate up to 2 Mbps in the 2.4GHz frequency. It provided a range of a whopping 66 feet of indoors (330 feet outdoors), so if you owned one of these routers, you probably only used it in a single room. Also known as China Millimeter Wave, this defines modifications to the 802.11ad physical layer and MAC layer to enable operation in the China 59-64GHz frequency band. The goal is to maintain backward compatibility with 802.11ad (60GHz) when it operates in that 59-64GHz range and to operate in the China 45GHz band, while maintaining the 802.11 user experience. Final approval was expected in November 2017. There are some products in the home-entertainment and industrial-control spaces that have 802.11 wireless capability and 802.3 Ethernet function. The goal of this standard is to help 802.11 media provide internal connections as transit links within 802.1q bridged networks, especially in the areas of data rates, standardized security and quality-of-service improvements. It reached draft status in November 2017. Known as High Efficiency WLAN, 802.11ax aims to improve the performance in WLAN deployments in dense scenarios, such as sports stadiums and airports, while still operating in the 2.4GHz and 5GHz spectrum. The group is targeting at least a 4X improvement in throughput compared to 802.11n and 802.11ac., through moreefficient spectrum utilization. Approval is estimated to be in July 2019. Otherwise known as “Wake-Up Radio” (WUR), this isn’t a crazy morning zoo-crew thing, but rather a new technology aimed at extending the battery life of devices and sensors within an Internet of Things network. The goal of the WUR is to “greatly reduce the need for frequent recharging and replacement of batteries while still maintaining optimum device performance.” This is currently expected to be approved in July 2020. This story, "802.11: Wi-Fi standards and speeds explained" was originally published by Network World.